Suitable shower drainage is included to former, it comes with 600 mm long steel linear end drain. It also comes with grating which is 70 mm wide, leaving 8 mm wide channel for water to flow. 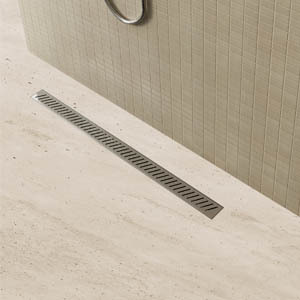 Grate is flushed with the frame, so there is no requirement for finish material height, although channel protrudes below the bottom shower tray surface for 10 mm. Steel is finished with brush, which is practical and particularly suitable for most architectural applications. Special degreasing cloth is included to clean the steel surfaces before gluing the finished floor surface. McAlpine siphon trap with capacity of 26 l/min and 20 mm high water seal is also included. Showerlay is complete unit with everything you need. Chat started. Session ID: 1556193982. You are now connected to: David M.